Question: How Bimodal Is A Methylation Distribution? Analysing methylation from a sequencing experiment, we seem to be having some bimodal distributed values. 1- Is there a way to assign a p-value (or any metric) on how bimodal a distribution is? 2- Does it even make sense to ask this question? (Why or why not?). Apologies in advanced if the question is too off topic. 1) The advice given in this CrossValidated thread seems solid. Really, if you've got a hairy stats question, those are the guys to ask. From work I am involved in on CpG islands I guess that your trends should be bimodal, it can be seen clearly in CpG island methylation in human and in full transcript methylation in Ciona. There will be a Deaton et al paper coming out in Genome Research later in the year that will also show that the 'CpG shores' hypothesis is less likely. The reference you gave is about someone who comments on a method based on a package that he never used or even looked at. Sorry, but it does seem a little bit too vague (plus it doesn't answer my question). Also, minus one for referencing Google. looks like a mixture distributions problem. If you data looks normal, then an EM algorithm and likelihood ratio test could solve this. I am sure this is not quite so easy. Actually, I get similar distribution from HumanMethylation450 data. 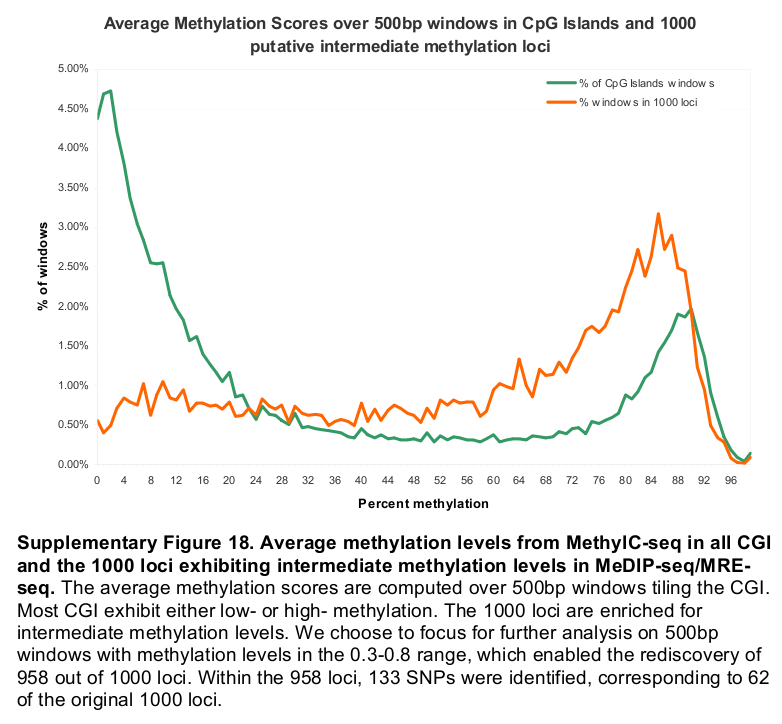 Why does methylation data have bimodal distribution?